I think I may have invented a new delicious Fair Food on a stick. 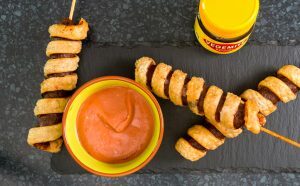 To make your roo rockets you need to first of all remove the skins and then place the sausages onto a long skewer. try to keep the stick in the centre of the sausage. Place the skewer sausages onto a tray and place in the freezer for a couple of hours. Whilst your sausages are freezing you can make the dipping sauce by adding all the ingredients together and mixing them well. Set to one side until ready to use. Once your sausages have frozen remove them from the freezer. Turn on your fryer and heat you il to the correct temperature. Take your puff pastry and cut into 1/2 inch strips. Lay one strip out and brush a little water on the end and firmly press the tip of a second strip into it so you make a nice long strip of pastry. 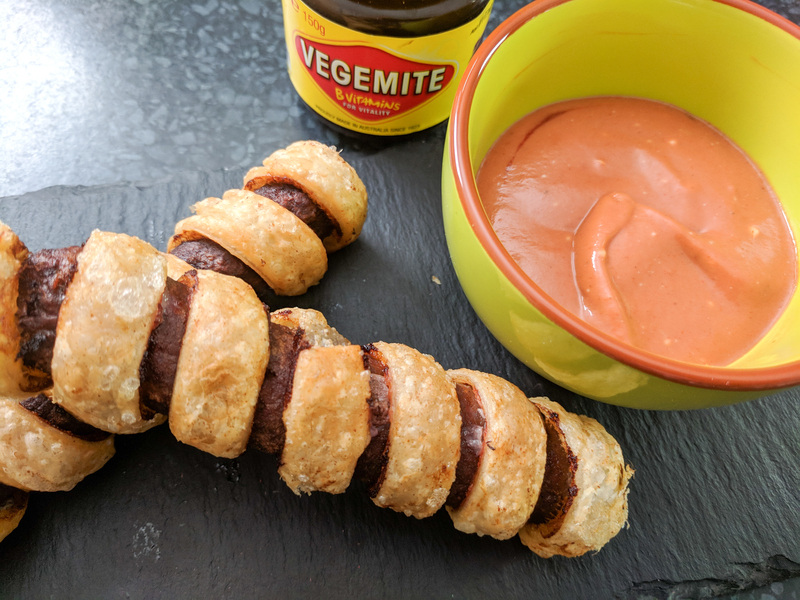 With a small knife spread some Vegemite along the whole length of the paster and the starting at the top of your sausage gently wrap the pasty around in a spiral. Leave a little gap between each edge of the pastry. Press each end of the pastry firmly to get a nice seal and grip. Once you have wrapped your sausage you can gently drop it into the hot fat to cook. This should take about 3 minutes to get nice and golden brown. Once the Roo Rocket starts to float and is golden remove from the hot oil and place onto paper towel to drain. Your Roo Rockets are now ready to be enjoyed dipped into that great dipping sauce. Yum Yum !! !